Click here for 16 full quotes from Mark Sanford in the book The Trust Committed To Me, by Mark Sanford. Our readers might wonder why Gov. Mark Sanford's book is here among the 2008 presidential books. That's because we predict that McCain will choose Sanford for Vice President. But first let's review the book. This book is Sanford's story of his 3 terms as a South Carolina representative the the U.S. House. It was published in 2000, when Sanford was retiring from the House, and presumably was thinking ahead to running for Governor. Hence this book outlines Sanford's accomplishments in the House, and his political philosophy, in preparation for his first gubernatorial run in 2002. The cover of this book, and its title, might make you think that it's all about Family Values or something about children. In fact, it's all about term limits, the issue around which Sanford defines his 3 terms in the U.S. House. The "trust" which was committed to Sanford in the title means "trust that Sanford would fulfill his campaign promise to limit himself to three terms in the House." Which he did, as he notes many, many times in this book. I guess the cover is just a nice photo of one of Sanford's sons on a nice South Carolina beach. Because the Contract With America never did pass Congressional term limits, Sanford describes himself as a "self-limited" House member -- he voluntarily restricted himself to three terms. Sanford makes a compelling case that "self-limited" Congressmen really do vote differently than other Congressmen -- because they don't have to worry about getting re-elected, and don't plan to have a career in the House. You can read the rest of the details in the excerpts below. One key aspect is that Sanford considers self-limited Congressmen to be immunized against pork-barrel spending (and to some degree, against corruption), because pork is mostly based on a desire to buy off one's re-election (and serious corruption is only possible when one has more power and experience). That core value makes Sanford very compatible with McCain's core issues of reform. Even if the two men agreed on nothing else, that would be enough for a compatible ticket. He is young (born 1960). McCain would be the oldest president ever elected, so that's a factor, and also, if Obama wins the Democratic primary, Sanford provides a same-age counter. He is Southern (a popular re-elected governor of South Carolina, where McCain has had a "troubled" political past). If Obama is the opposing nominee, the South is certainly not a sure-win for the GOP, since the Democrats can expect very high black voter turnout, and the South has several states with very high black populations. He is a governor. McCain has no "executive experience", which normally would be a big factor, but will likely be less important against another Senator. Sanford, however, is a "budget hawk" (which governors actually do something about, as part of their executive experience) -- which matters because McCain is weak on economics. He is conservative. Sanford's conservative credentials have never been questioned, as McCain's routinely are. 2008: Sanford was passed over for the vice-presidential nomination in favor of Sarah Palin. 2009: Sanford served as chair of the Republican Governors Association, and was seen as a "rising star" of the GOP. June 2009: Sanford went missing from office for several days, claiming to be "hiking the Appalachian Trail." A reporter caught him exiting a plane from Argentina, where he was visiting his mistress. 2010: Divorce finalized. Wife Jenny Sanford later considered running for office against Mark Sanford; filed trespassing complaints and publicized them during his later candidacy; etc. 2011: Sanford left the governor's office after serving his full term, having survived two impeachment resolutions and two censures (U.S. House and S.C. House). 2012: Sanford marries his Argentinian mistress, Maria Belen Chapur, and works as a commentator on Fox News. 2013: With Tim Scott's House seat vacant after Scott's appointment to the Senate, Sanford ran for his old House seat; winning over Elizabeth Colbert Busch on May 7, 2013. 2014: Sanford is running unopposed for re-election to the U.S. House of Representatives. Sanford's book can now be read in a whole new context, given the developments above. The title is especially ironic, in retrospect. We look forward to another book, which would certainly provide a new level of guidance for political survival and political comebacks. Incumbents spend more tax funds the longer they�re in office. Deficit spending hurts private business & personal finances. Federal deficit weakens dollar against foreign currencies. No congressional pay raise until budget is balanced. Highway bills are congressional bribery. Sugar subsidy is corporate welfare to a wealthy few. 1997: proposed freezing State Department budget at $6.3B. Sugar and peanut subsides make no sense. Cut his own staff and returned funds for staff pay annually. Supported 6- year congressional term-limits. Pledged never to take any PAC money. 1995 government shutdown was a good thing, not a crisis. Require that congressional pay raises have open votes. Term-limited Congressmen do behave differently. Off-budget accounting undermines trust in government. Highways are Congress� responsibility, but don�t break bank. 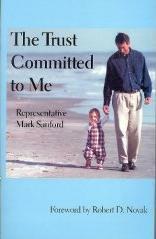 The above quotations are from The Trust Committed To Me, by Mark Sanford.